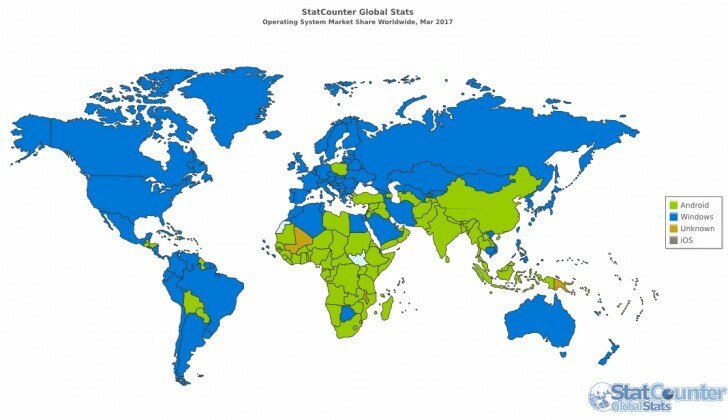 A new report from StatCounter states that Android has surpassed Windows as the world’s most popular operating system for browsing the internet. StatCounter is a free online tool that lets administrators keep track of their web traffic much like Google Analytics. The report is based on a sample size of over 15 billion page views per month and the mention “Internet usage” is strictly the viewing of website pages. This report does not include app or data usage as part of the results. The chart above shows overall internet usage market share over the past five years. 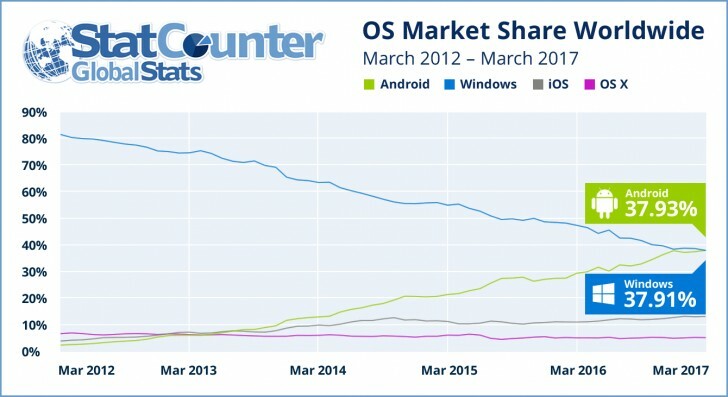 Here you can see the steady decline of Windows as the primary internet device has inversely shifted to Android on a world-wide scale. Internet usage share varies per country. If you take a look at the world map, take notice that the majority of countries where Android is primarily used to browse the internet tend to be developing countries where many folks rely solely on their mobile device to get everything done that needs to be done on the web. In North America, laptop/desktop internet usage is still above the overall mobile usage of internet, though not by much more. Countries where Android is the primary OS for internet usage are the ones that drive the worldwide number up past Windows in the world-wide calculation. Here’s a fun tid-bit for you statistics junkies out there. You can go to StatCounter’s website and click "Edit Chart Data" which lets you change data parameters however you'd like. You can also include or exclude a particular country or operating system. For vast majority of people they do not need a PC which also eats up space in the home. However majority will have a cell phone of some kind hence Android is most "popular" since it is in handsets in all price budgets.